First Line: The first time I saw Audrey, I almost didn’t. The next time I saw her, she was sending signals. There couldn’t have been anyone up there answering back… could there? Synopsis: From the front jacket-flap- Audrey comes into Ray’s life like an earthbound star. Everything about her is a bit far-out. And she always seems to be in her own little world. So Ray decides that this unusual girl who has dropped into his neighbourhood for the summer must be an alien. As the two become friends, Audrey takes Ray on a journey of discovery – one that enables him to see his own planet in a new light. Now Ray can’t imagine life on Earth without her. Can he convince his new friend to stay? 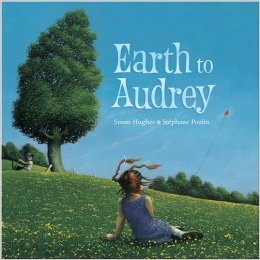 Susan Hughes’ touching, gently humorous story and Stephane Poulin’s evocative and surreal illustrations perfectly capture one summer in the lives of two lonely dreamers and the very special friendship that emerges between them. Why I like this: I loved the way Audrey shows Ray how she sees Earth and he believes her to be an alien with her unusual activities and actions. Although this seemed to have more words than a normal picture book I was hooked from the first page of this tender tale. The beautiful oil illustrations in backdrop of dark blue-greens are fun and interesting. Like stepping out at dusk into a world to dream in. This entry was posted in Children's literature, Picture Book Review and tagged Children's Picture book, childrens literature, Friendship, Stephane Poulin, Susan Huges, Susanna Leonard Hill. Bookmark the permalink. Boy, does that cover grab you! I love the idea behind the story. I imagine the illustrations are gorgeous. Great choice. Thank you, Pat. Yes the illustrations are deep and magical. Glad you like it. Boy! This one sounds excellent! Audrey sounds like my kind of girl and Ray sounds pretty interesting as well. A boy with some imagination! Thanks for sharing! Haha, glad you like it Rhythm. Audrey is a bit far-out but I think it’s just the way she looks and if you saw a couple of illustrations inside you will realise she is not as far-out as she seems at all. I’ve got the book on my want list now! Thanks! This looks fascinating. And I love the message. Thanks for the great post! Yes it is lovely, isn’t it. Anyone can be a friend. But Audrey is no different to anyone of us… I can’t say anymore but an illustration near the back makes you realise where she comes from… hehe, Nope can’t tell you anymore…. This sounds so sweet – hope I can find it. Thanks, Diane. I hope you do…. an illustration near the back will make you go Oh, now I know…hehe! Enjoy! Can’t get it, but I’ll make a purchase suggestion! What a lovely-sounding book, Diane! I’m curious – is Audrey a real girl or an imaginary friend? I can’t tell… I guess I’ll have to go find this and read it so I know! Thanks so much for sharing! Haha… she’s real enough…. but take a look at it…. you’ll see why she appears different…. she’s not really at all. Sorry can’t say anymore. This sounds like an intriguing story – definitely going to have to read it! Yep, it sure is. You will love it… Make you smile, I am sure. Thanks, Sue. This sounds a bit like STARGIRL by Jerry Spinelli. 🙂 I’m putting it on my TBR list! I smiled reading your comment. You are too young to know why Audrey appears so different…. I can’t say anymore, without whispering in your ear. Hope you find it and I am sure you will enjoy it. Your parents will smile when they see an illustration near the back. This sounds unusual and interesting. I’ll have to find this one. I love the cover! Thanks, Penny. I am sure you will enjoy it. This sounds sweet and hopeful and unusual.